I don’t know if it’s the food, the beautiful cities, the breathtaking landscapes or just a mix of all of these elements, but Italy is becoming one of my favorite countries in the world. My latest pit stop was in Verona, in the Veneto region. And although it was a really short stay of only 2 nights, I was beyond impressed by this city. 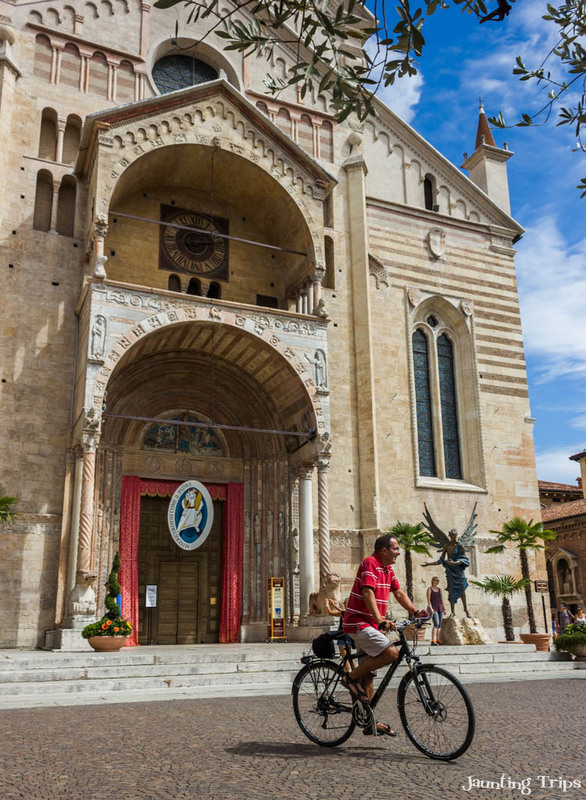 Declared a world heritage UNESCO site in 2000 for its beautiful architecture and history, Verona is more than just the center stage for the famous love story of Romeo & Juliet. The architecture, the streets, the history of it all is absolutely stunning. It is probably one of the best cities to get lost into. As usually, Airbnb was my to-go option for accommodation, and yet again it didn’t fail me. I stayed in this absolutely charming apartment right in the heart of the city, on the banks of Adige river, with all the main attractions within my reach. Considering this was a short stay, I chose to use the Verona card, and I highly recommend it. For 18 euros (24h) or 22 euros (48h) you get access to almost all the tourist sites and public transportation for free. But if you want to feel the essence of the city, you should skip the bus rides and get your explorer mode on. 2 Wherefore art thou Romeo? Contrary to popular belief, one of the first things you must see is… NOT Giullieta’s house. 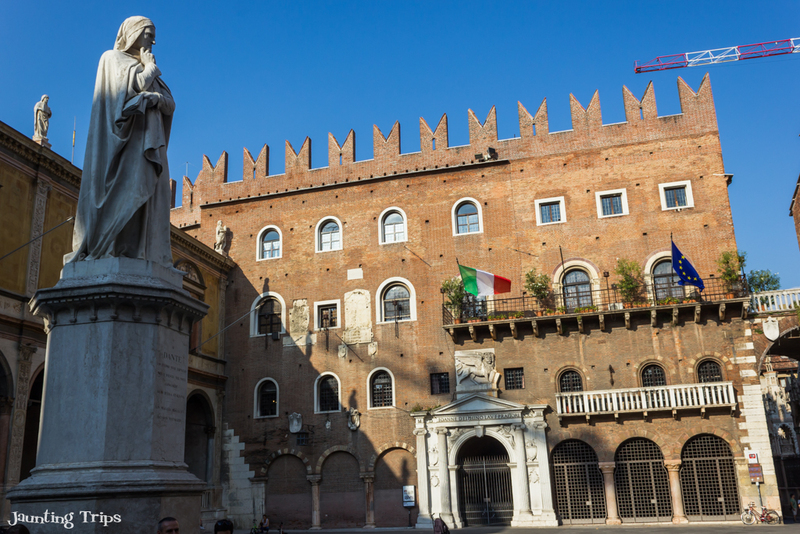 Just like the welcome hall of an exquisite theater, Piazza Bra and the Arena are the best starting point for exploring Verona. So get your comfy shoes on, grab a cappuccino and a brioche at one of the many terraces overlooking the piazza and get ready to start your journey. The Amphitheater of Capua was built in the 1st century AD, and it’s the second largest arena after the famous Colosseum. 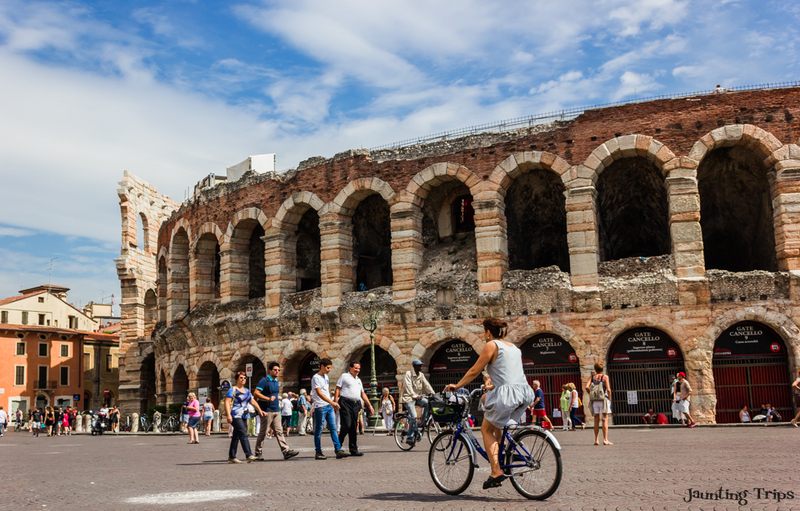 If initially it hosted gladiator fights, now the Verona Arena is best known for the Verona Opera Festival. And let me tell you.. the acoustics are absolutely amazing. I could literally hear the people whispering on stage from all the way up. So be careful what you’re giggling about. 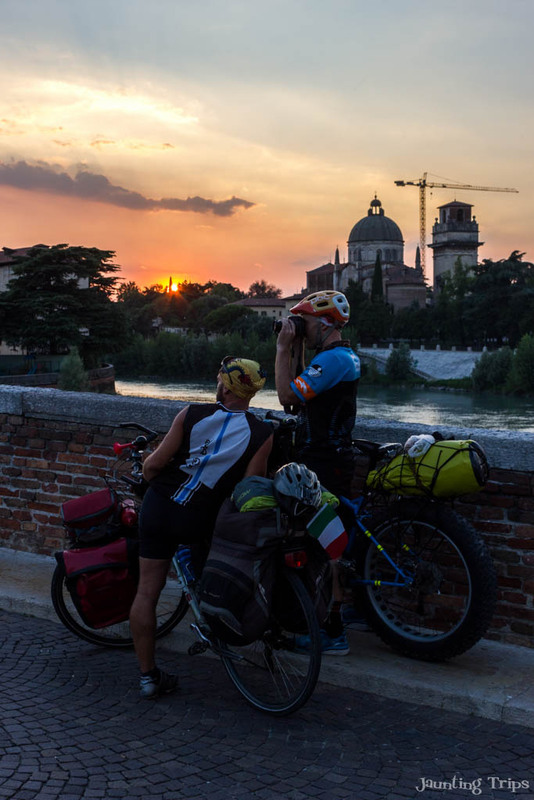 Moving along via Roma, you can reach Castelvecchio and Scaligeri Bridge, over the river Adige. 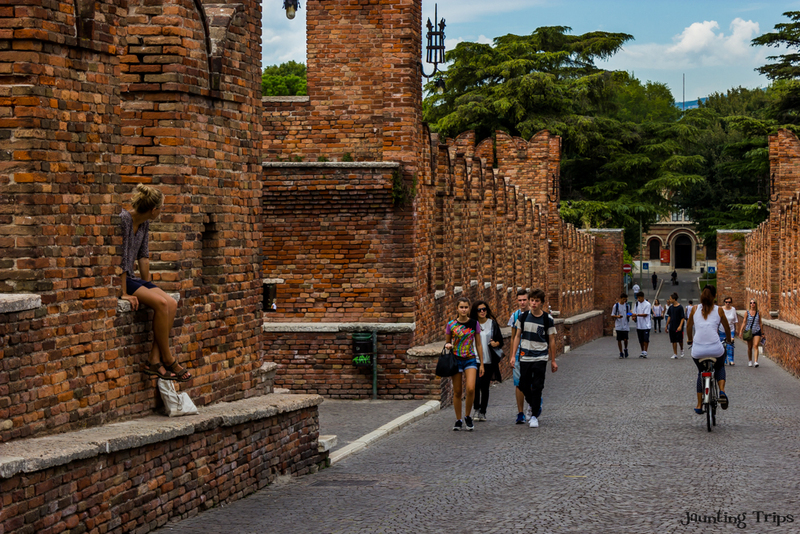 This beautiful red brick fortress is one of the main landmarks in Verona. From Castelvecchio I headed back to the old center, on Corso Cavour until I reached Porta dei Borsari. This used to be the main entrance to the city. The name comes from the fact that here is where you paid your taxes if you were a traveling merchant. So do you have anything to sell? Next, heading towards the center of the old city, you will reach the main shopping street – Via Mazzinni. All the shops you want at your fingertips! But this is not the time for shopping. I just started to discover this beautiful city, and I don’t plan on burdening myself with shopping bags. And I know myself… I don’t usually shop, but when I do… I can call it a workout. Heading down the street, you will reach via Cappello and the famous Casa di Giulietta. Don’t worry, it’s not hard to find. You just follow the flocks of tourists trying to fit in the small courtyard to take a picture groping Julliet’s left breast (for luck apparently). 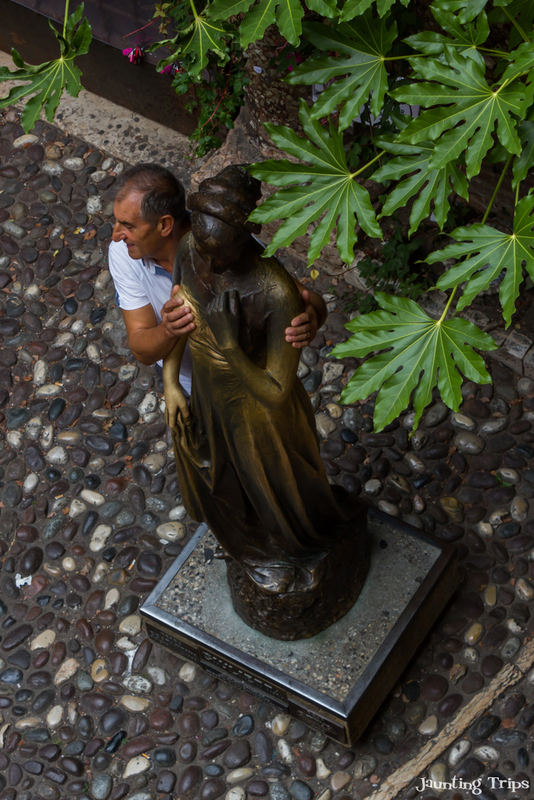 This must be the most groped statue in the world. I doubt David gets this much attention. A little luck from Giulietta? How many stood the test of time? 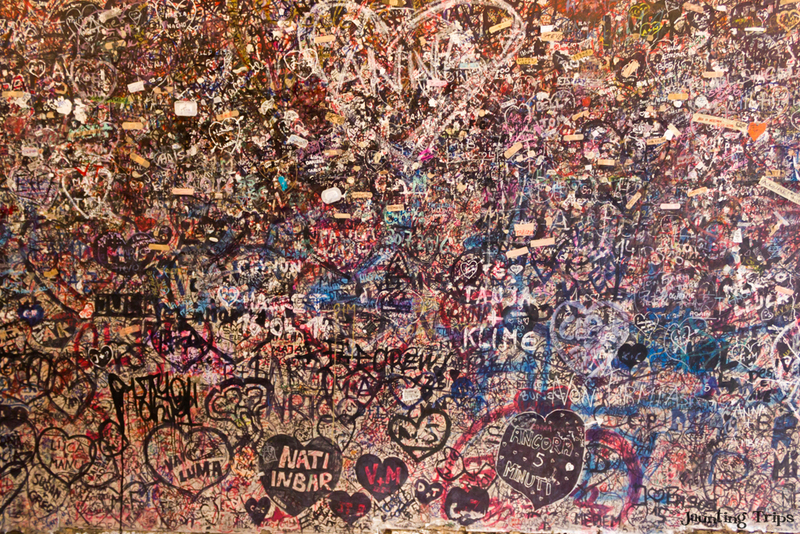 The place is absolutely packed and there is hardly any room left to write something on the walls. I’ve seen people writing on actual chewing gum and band-aids! 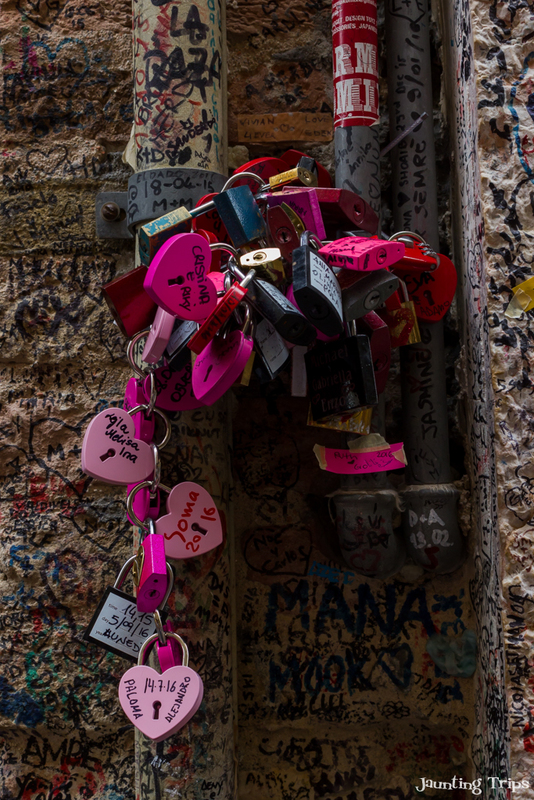 There are love lockets everywhere! I wonder how many of them actually stood the test of time. Sure, a couple of streets away there is also Romeo’s house. But guess what… it’s closed and has a camera directed at the door. My guess is that he is screening. Not sure if he hiding from Juliet or “all the single ladies”. Swipe left or right, Romeo? Casa di Romeo – Where are thou Romeo? Hiding? Leaving Giulietta behind, I head up towards Piazza delle Erbe and Torre dei Lamberti. The piazza was once the town’s Forum. It’s a good spot to grab lunch or buy some souvenirs from the local market. This is where I found my Romeo & Julliet on a Vespa. Can’t get more Italian than that. 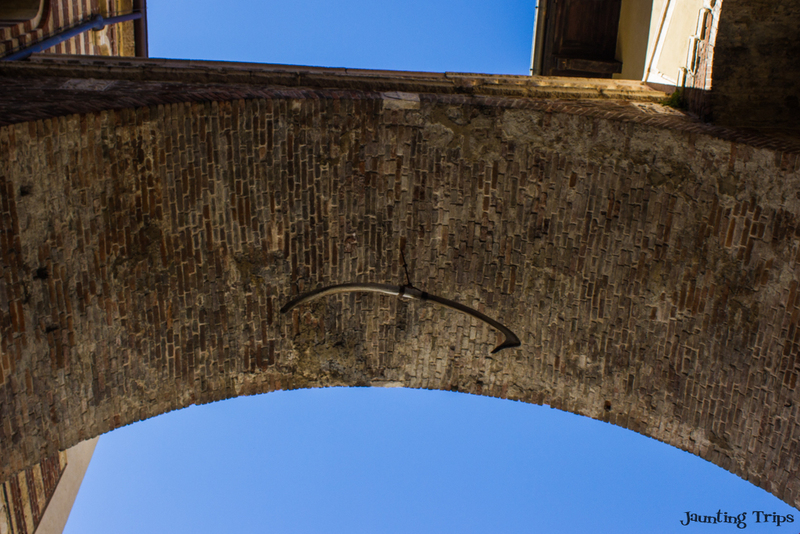 When you leave Piazza delle Erbe, be sure to look up. You will see a huge whale rib hanging down from an arch. This is Arco della Costa. 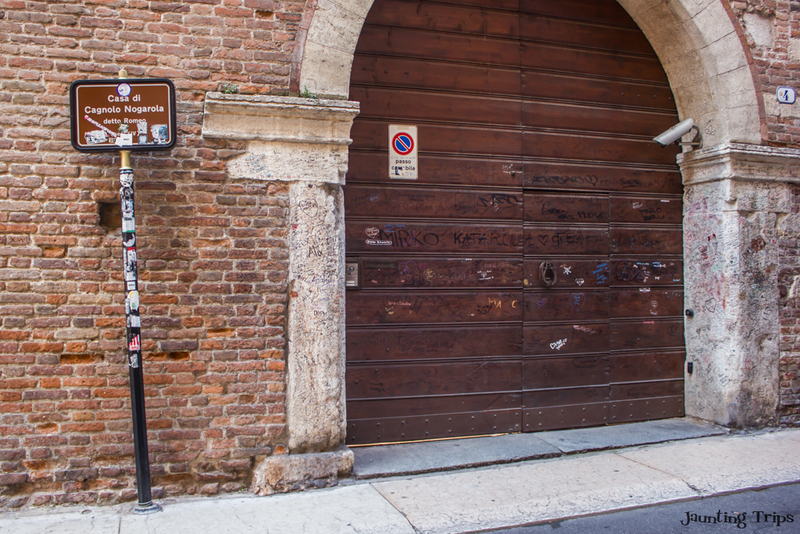 When you go underneath it, to reach Piazza dei Signori be careful. The legend says that the rib will fall on the first person who passes by and has never ever told a lie! I am still writing you this blog post post so… I’ll just leave it at that. Arco della Costa – Have you ever told a lie? You must be wondering, all this walking around Verona, an Italian city, and no mention of any church. Well I’m getting to them. 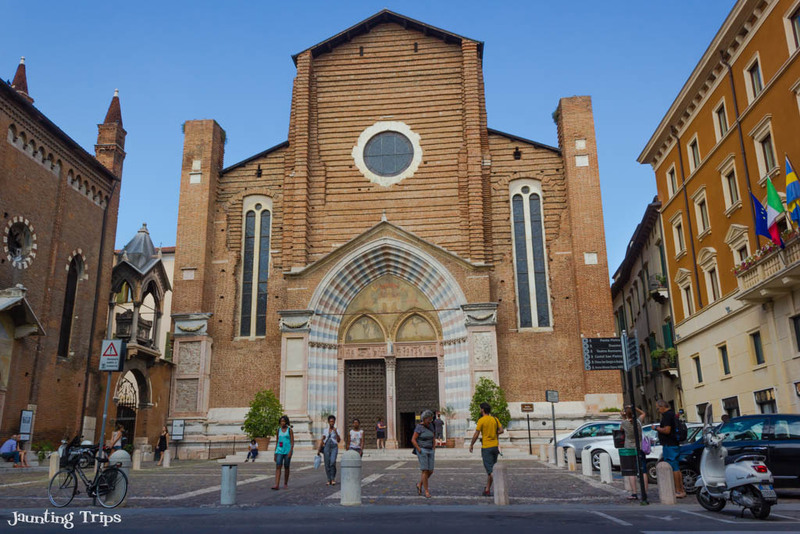 Moving away from Piazza dei Signori, the next stop on the map was Church Sant’Anastasia. I am not a religious person. I go maybe once a year at Easter, and on special occasions like baptisms or weddings. 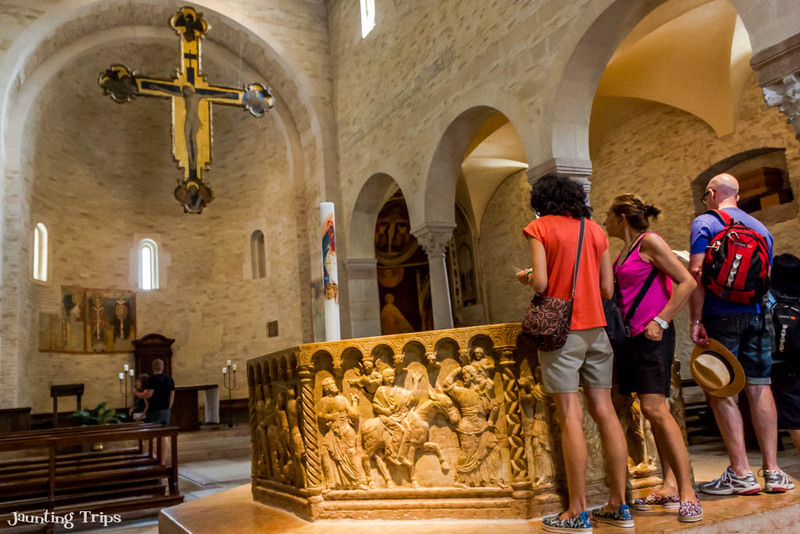 But there is something fascinating about the Italian churches. They are real works of art, from the architecture to the frescoes. Some of them are really breathtaking, and Verona didn’t disappoint. 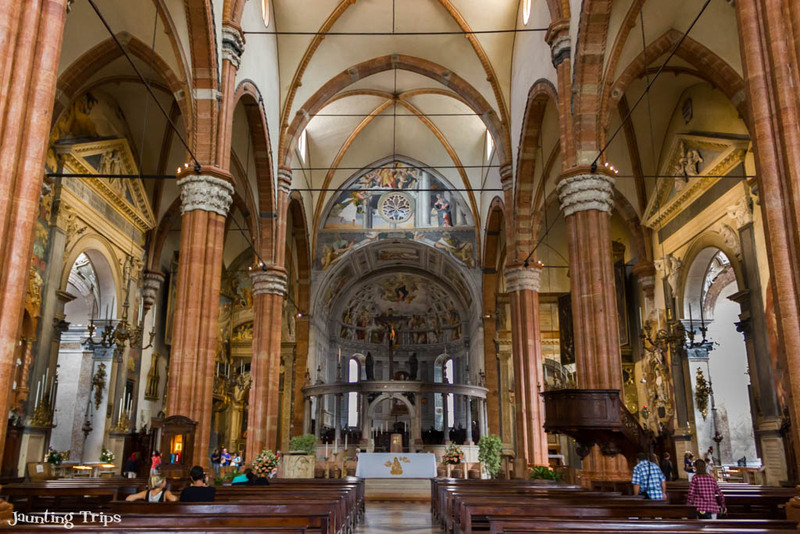 This massive Gothic masterpiece is the largest church in Verona, and you will recognize it by its red brick color. 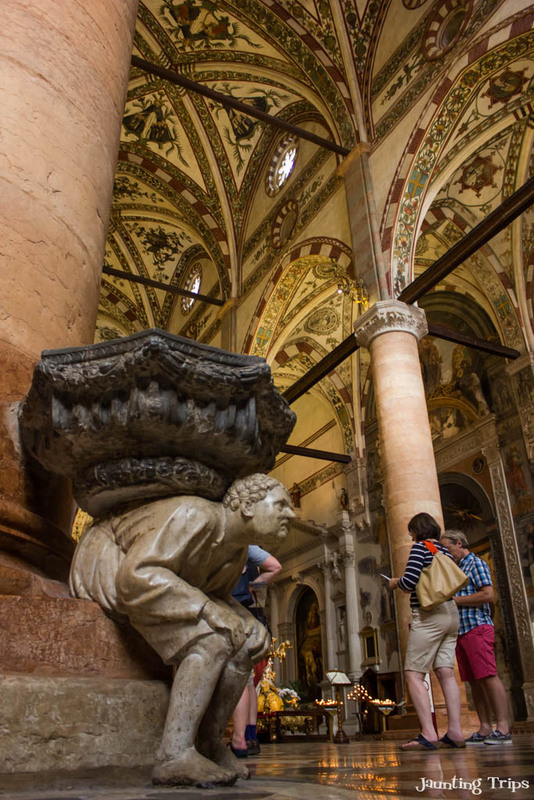 At the entrance you will be greeted by the two hunchbacks holding the holy water basins. Did you know that touching a hunchback on the hump will bring you luck? Well a little luck doesn’t hurt anybody. 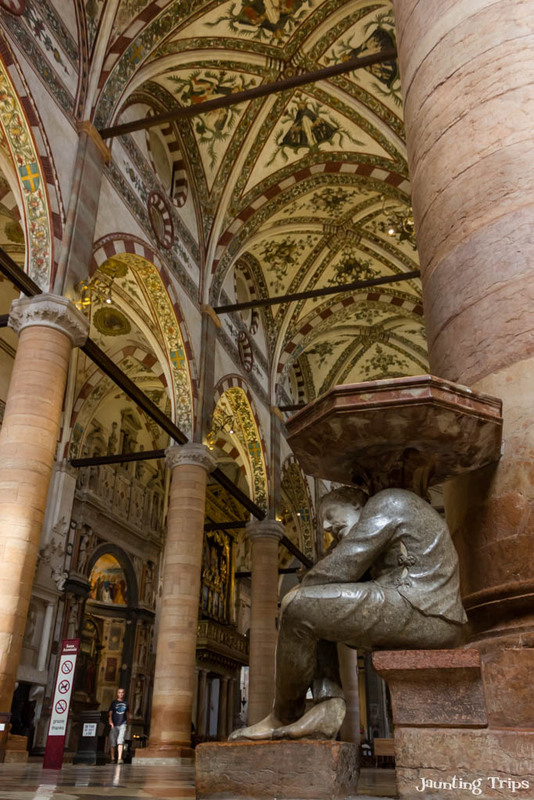 Before heading to Ponte Pietra and Castel San Pietro, there is one more stop, at Verona’s Duomo. This is actually a conglomerate of religious buildings linked together: the actual Duomo, the baptistery, the Canonical Museum, the cloisters, library, the bishop residence and the white bell-tower. The entrance of to the Duomo is guarded by the Blue Angel of Acceptance. As the sun is getting ready to set, my power walking tour is also coming to an end. 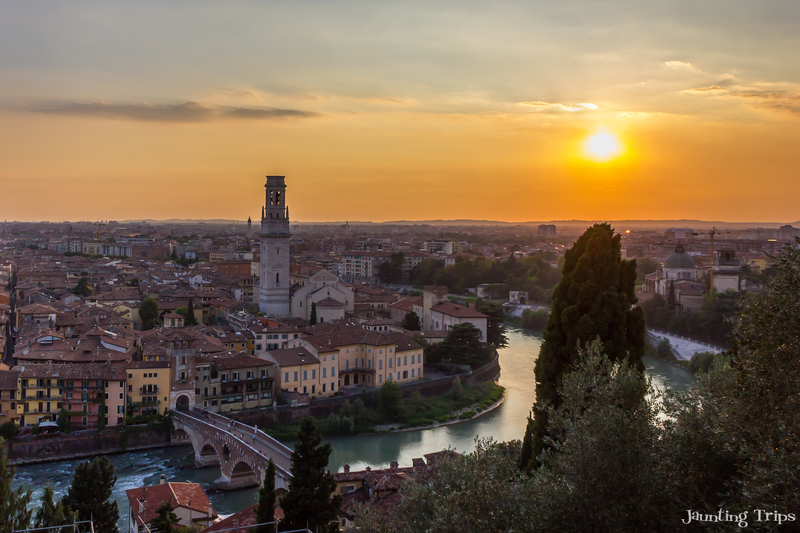 But I can’t end the day without a beautiful panorama over Verona. Best place for this is across Adige, up to Castel San Pietro view point. You cannot visit the castle because it is under renovation, but the view is certainly worth the walk. 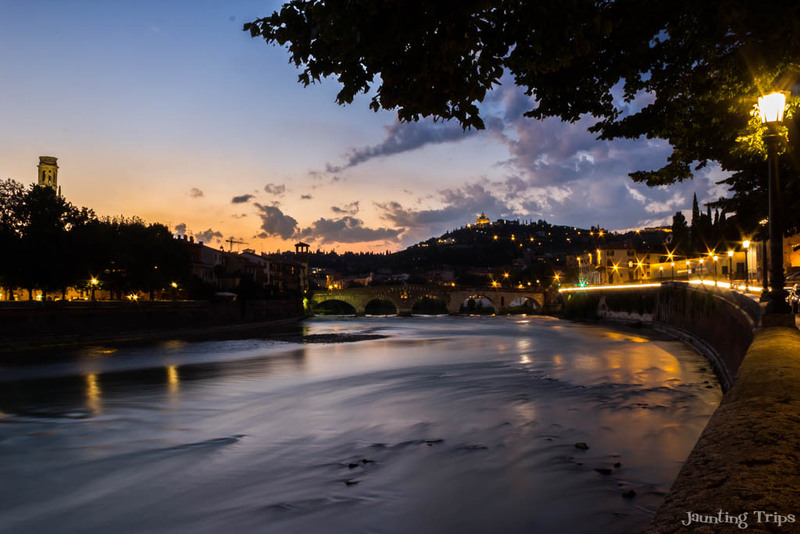 As the day comes to an end, right before dinner, I highly recommend an evening walk on the castle’s side of the Adige. 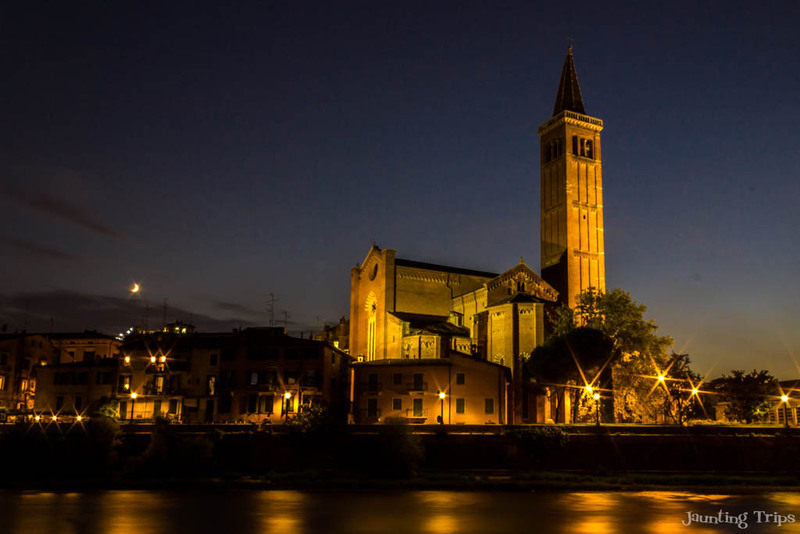 It’s excellent for a night view of Verona and you can take some awesome evening/night shots. I’ll leave you with these final shots of Verona and hope you will enjoy this city as much as I did. For me, it’s a definite add on my come-back list. Verona Card: 18 euros (24h) or 22 euros (48h). It grants free public transport and free access to all the main tourist attractions. Wear comfy shoes. You will be doing a lot of walking. Food wise, try the horse meat. Very interesting! As for the wine… you can’t go wrong with the house wine. 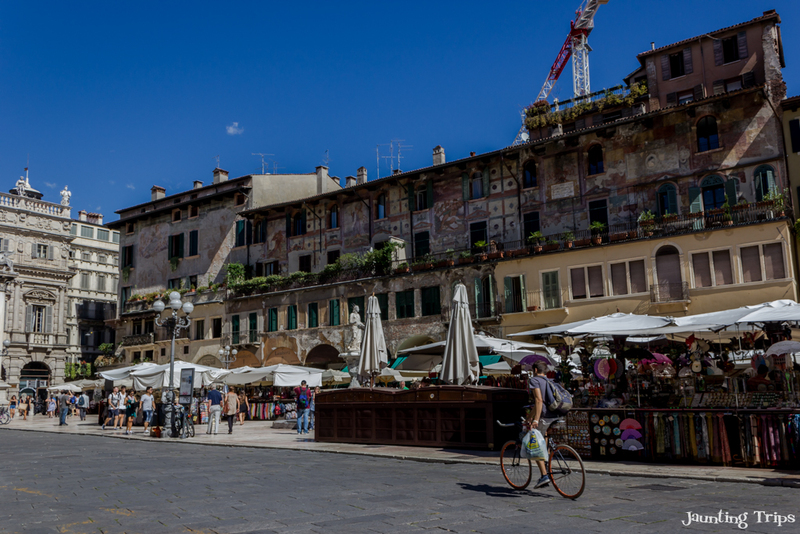 And of course, when in Italy… grab an ice cream in Piazza Bra.